To honour the 50th anniversary of his death, this is the first time we get to see Orton’s original version of the script before the Lord Chamberlain censored it prior to the 1966 production. 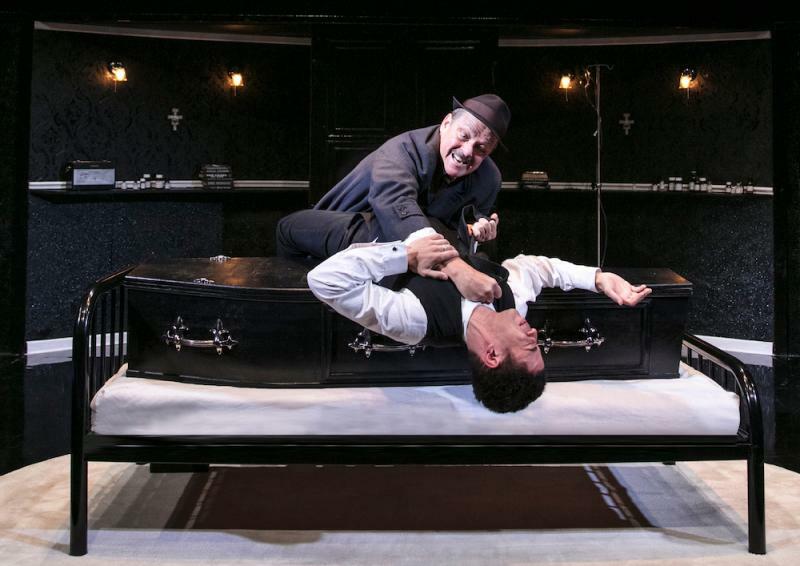 The play is set in the middle-class McLeavy family home, whose matriarch (Anah Ruddin) is lying in state in the middle of the living room in an open coffin. Designer Gabriella Slade’s set presents a drab, post-war interior which is almost completely black to emphasise just how dreary a world these characters live in. We find her husband, McLeavy, in mourning and being comforted by the palliative care Nurse, Fay, who we learn has a sinister, homicidal history. Soon McLeavy’s son Hal (Sam Frenchum) and his friend Dennis enter the house having just committed a bank robbery. In a state of panic they decide to hide the stolen money in Mrs McLeavy’s coffin, thus removing McLeavy’s corpse and stuffing it into the living room closet (in this sequence, Anah Ruddin shows remarkable flexibility). The farcical elements of the play really kick into gear when Inspector Truscott (Christopher Fulford) visits the house and becomes suspicious of Hal and Dennis’s behaviour. No spoilers, but it’s fair to say that whilst they play’s structure very much follows the model of a traditional farce, Orton was making a social point about the ills and hypocrisy which he saw in society. Almost every character in the play is venal, self-serving and corrupt. No one is particularly likeable, but that doesn’t really matter as it’s the comedy of play which sustains it. The most sympathetic character is McLeavy (Ian Redford), who is the main victim of the story. Michael Fentiman directs with plenty of pace, but still allows for moments where the audience can enjoy the events. This is a good opportunity to see the work of a writer who wrote some brilliant plays in his short career. It left me wondering what he would have made of events in today’s farcical, political climate. Loot runs through 24 September.